First time’s the charm for Netflix’s burgeoning feature film division. 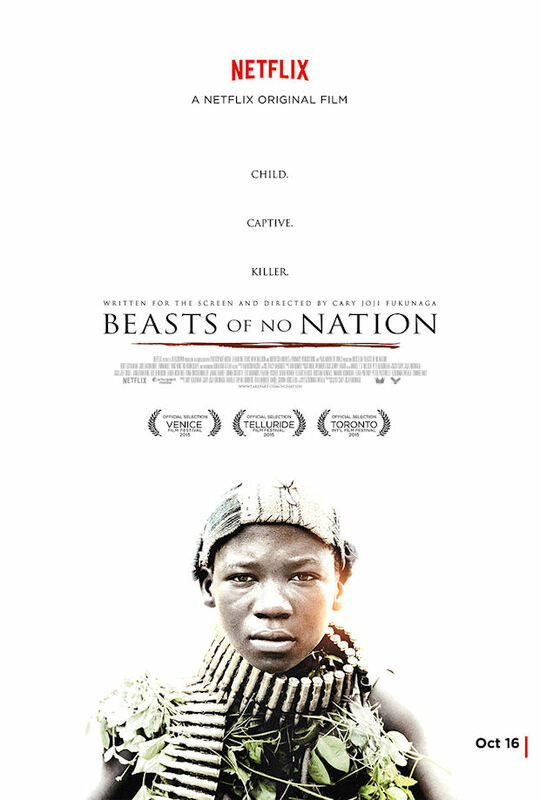 Cary Joji Fukunaga’s tough Beasts of No Nation follows Agu (Abraham Attah), a young boy who loses his family as civil war breaks out in his unnamed nation. He is then captured by a rebel militia and taken under the arm of Idris Elba’s charismatic Commandant. Elba convinces as the bloodthirsty leader and his coercion of Agu is suitably inescapable. However, it’s Attah who steals the show. He delivers a mighty performance as the innocent charmer turned ruthless killing machine. Much of the film’s dramatic weight rests on his shoulders, and he rises to the challenge magnificently. Especially impressive for an actor of his age is his ability to convey such complex emotions so purely using simply his eyes. Fukunaga seems in tune with this rare talent and lenses Attah in a number of chilling close-ups. Fukunaga, acting as the director of photography alongside his writer-director credits, establishes a harrowing frame, which is made even more shocking by the sheer beauty of his visuals. The colours sing, as forests green and trenches ferric are trampled by a pair of marching size 4s. Fukunaga displays the same visual flare he has become known for since his work on the first season of True Detective. Particularly in a handful of unflashy, but undeniably impressive, long takes as he sends his camera gliding through trenches with Kubrickian confidence. The film packs it’s heftiest punch before the 90-minute mark, before fading somewhat as the Commandant leads his troops away from the rebel movement. This aimlessness comments on the fact that the Commandant is a man of war – and what exactly is a man of war to do during peacetime? – but offers little depth beyond that. That being said, Beasts of No Nation is a powerful piece of cinema. The messages are clear, but Fukunaga’s visual excellence and Attah’s immense performance ensure they are delivered like never before. Beasts of No Nation is available to stream via Netflix.